Amy Ireland and Virginia Barratt carry on this tradition of public manifesto recitation in an eccentric performance that is both artistically and politically charged. The performance is presented as part of an exhibition at Woolloomooloo’s Firstdraft gallery curated by Frances Barrett. Entitled Haunting, the exhibition explores artworks that use historical narratives to produce temporal shifts by conflating past, present and future. In Ireland and Barratt’s performance, it is two feminist manifestos, and two of the women who produced them, that communicate across a 20-year gap. Dressed in white jumpsuits, Ireland and Barratt engage in forwards and backwards recitations of VNS Matrix’s 1995 Cybermanifesto for the 21st Century along with extracts from Laboria Cuboniks’ 2014 manifesto, Xenofeminism: A Politics for Alienation. By contrast, Cuboniks’ recently published manifesto sprawls over 27 dense paragraphs categorised into seven sections. Amy Ireland is involved with this xenofeminist collective that is spread across five countries and three continents and whose stated mission is to “dismantle gender, destroy ‘the family’ and do away with nature as a guarantor for inegalitarian political positions.” Centred on trans-politics, the manifesto seeks to create “a feminism at age with computation” by calling on technology to be repurposed for progressive gender political ends. It is a strange and potent experience to encounter these two feminisms, past and present, in dialogue. The performance space, meanwhile, evokes the uncertain space of a radical technological future, with a neon green X marked on the floor across which the women slowly travel, each on her own axis, alternately facing toward and away from us. At one point, three small remote-controlled flying toys are unleashed into the space, loudly buzzing and crashing into the walls but providing an unfortunate distraction from the power of the spoken words. Cuboniks’ manifesto is readily accessible online but has been printed on paper for the occasion of Haunting. It reads as not so much haunted but rather inspired and impelled by the cyberfeminisms that preceded it. Yet while it echoes the urgency of past feminist manifestos, the text does not shy away from interrogating their limitations and failures, boldly reimagining the untapped political potential of technology for a contemporary era. 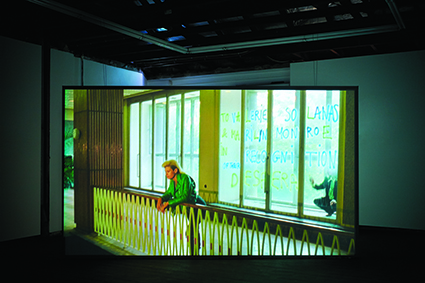 Alongside the printed text, the exhibition features two video works, Pauline Boudry and Renate Lorenz’s To Valerie Solanas and Marilyn Monroe in Recognition of their Desperation (2013), and Geo Wyeth’s Quartered (2013-2014). In Boudry and Lorenz’s film, six artists perform a 1970 score composed by Pauline Oliveros and inspired by Valerie Solanas’ radical feminist “SCUM Manifesto.” The score tasks the performers to make autonomous musical choices and respond to the dynamics of the group by rejecting the hierarchical structures of traditional compositions. With the camera panning the performers who each play different instruments, the piece feels like an anarchic rock concert with no centre. The converging noises progressively take on a life of their own as the performers don’t just play but also listen to one another, becoming their own audience. Quartered follows performance artist Geo Wyeth’s journey to the deep American South, tracing the history of an old relative. Wyeth’s identity as a biracial transgender man is explored in a dreamlike reverie, juxtaposed with jarring DIY-style editing that prevents us from getting too comfortable. Memory and history are revealed to be both real and imagined as Wyeth’s personal and family histories, national historical traumas and Southern mythology intersect in an original feat of evocative storytelling. The works that make up Haunting are tied together by their interrogation of the past and fearless imaginings of the future. Joining these politically inspired artists and activists is an unexpectedly empowering journey.